Escherichia coli or E. coli is a bacterium that can be found in human intestines. 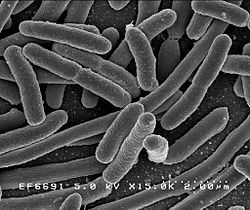 Scientists have studied E. coli very extensivley, and know more about how E. coli cells work than any other organism. E. coli is not always harmful. In fact, the only known harmful strand is O157. Escherichia coli Facts for Kids. Kiddle Encyclopedia.